Figure 9.6. Oblique aerial view of the Minidoka Relocation Center. There were over 600 buildings at the relocation center. Minidoka had an unusual layout due to the uneven terrain. 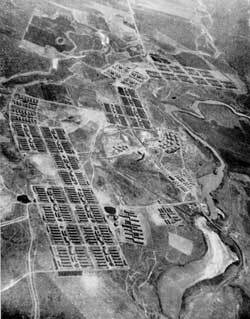 At the other relocation centers, the barracks are all within a single large rectangular area subdivided into blocks, aligned on a single grid system. 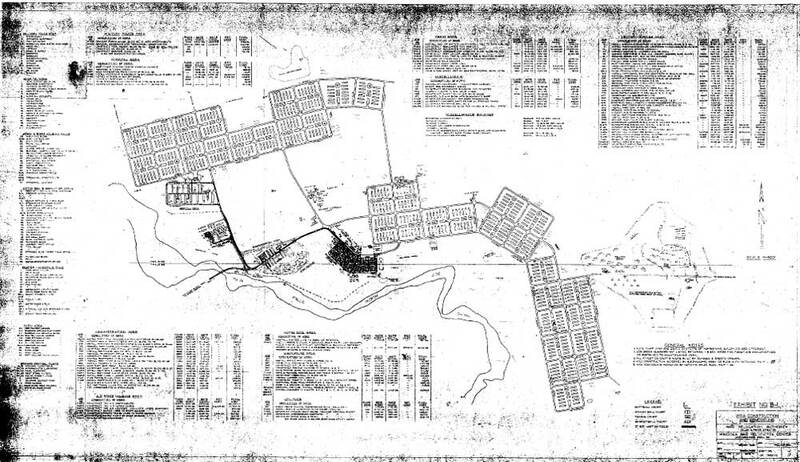 At Minidoka, the barracks blocks are in four separate groups following the arc of the North Side Canal, so that the block grids vary from the standard north-south orientation. 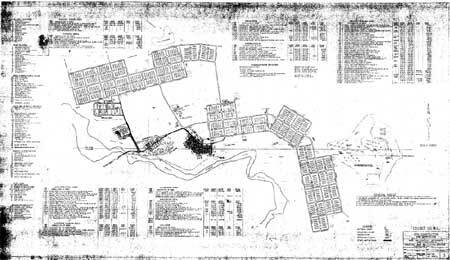 Administration areas of the relocation center also were geographically separate, with their grids laid out at slightly different angles (Figures 9.4-9.6). There were 31 buildings in the administration and staff housing area, 19 buildings in a warehouse and motor pool area, 17 buildings at the hospital, and 15 buildings at the military police compound. 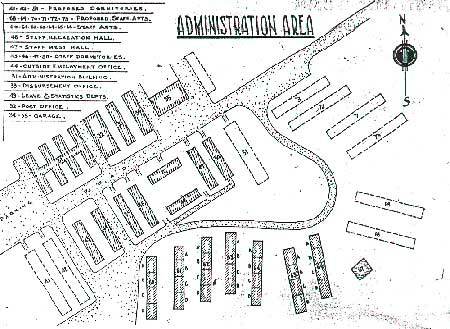 Another unusual feature of the Minidoka layout is that although the residential blocks were numbered up to 44 not all numbers were used. Several blocks (for example, 9 and 11) never existed. 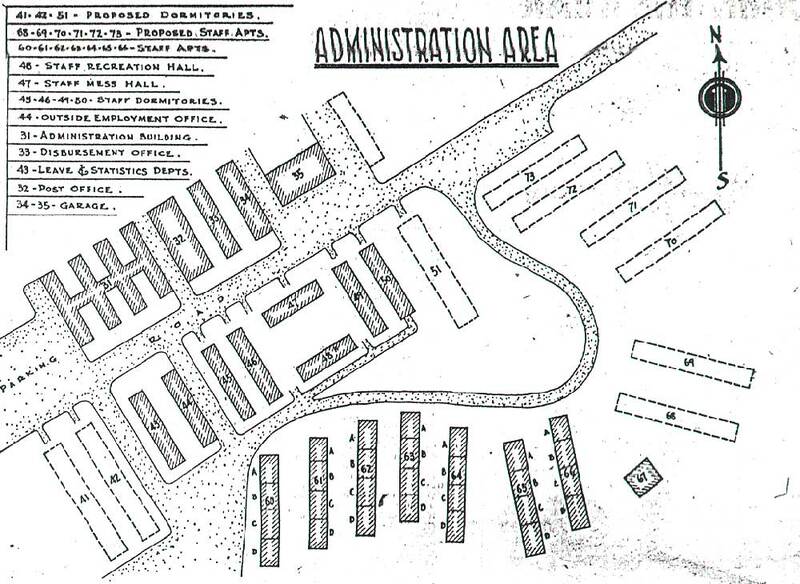 Each of the 35 residential blocks had 12 barracks, a mess hall, a recreation hall, and a central H-shaped building with bathrooms, showers, and a laundry. Also within the residential areas were four general stores, two dry-goods stores, two barber shops, a beauty shop, two mail-order stores, two dry cleaning stores, two watch repair stores, two radio repair shops, a check cashing service, two elementary schools, a health clinic, and two fire stations. A civic center, high school, and the evacuee-run community offices were centrally located in Block 23. In the vacant area between administrative areas and residential blocks were wells, a well house, and a sewage disposal plant. Figure 9.4. Minidoka Relocation Center. Figure 9.5. Administration area, Minidoka Relocation Center.